What kid isn’t fascinated with Monster Trucks?! 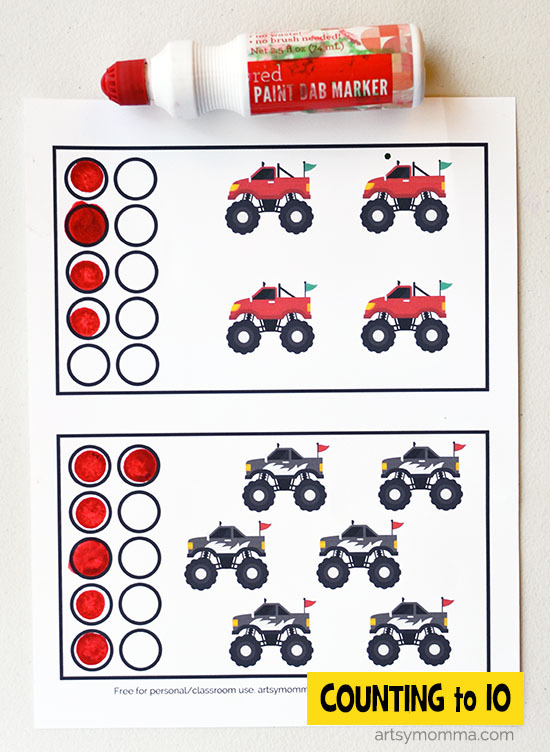 Today we are sharing monster truck counting printables that are great for preschoolers. We have also collaborated with a handful of other kid bloggers to bring you a fun transportation theme. Besides monster trucks, there’s air transportation, diggers, and a matching game with six common vehicles you find in a city. *This post contains affiliate links. Please read our disclosure policy for more on this. The printable pdf has five sheets total for counting 1-10. There are a couple different ways to use these printables with your preschooler. 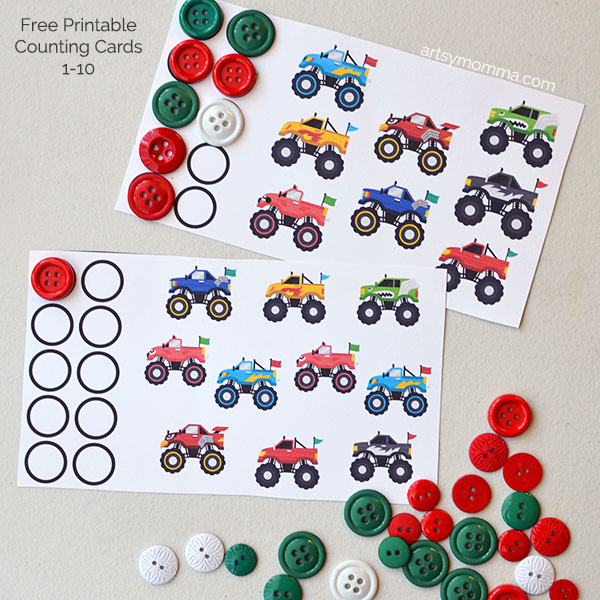 You can use them as a one time counting activity or make them into reusable counting cards. Using them one time: these are great to use with paint daubers/do-a-dot markers. All they have to do is stamp the circles, counting as they go so that it’s the same number as how many monster trucks they counted. If you don’t happen to have dot markers, regular markers/crayons can instead be used to color the circles. Using them as counting cards: Cut all ten cards out. Idea #1 is to laminate the cards and use them with dry-erase markers or balls of playdough as counters. Idea “2 is to use them with counters such as gems, rocks, pennies and so on. They would not have to be laminated, but of course could be to make them more durable. To add to the monster truck theme, here are some books suitable for the preschool age group including the popular Blaze and the Monster Machines.